Early Times Kentucky Whisky tells BourbonBlog.com that they have just released a one-time, limited release expression celebrating their 150 anniversary in a 375ml commemorative bottle seen to the left. 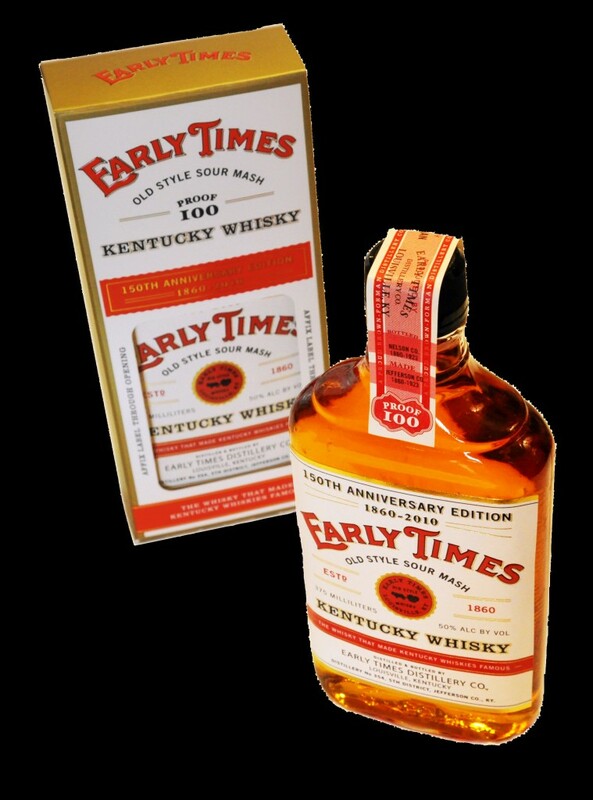 The Early Times 150th anniversary edition is bottled at 100 proof and carry an Early Times retro 1920’s label. Early Times is usually bottled at 80 proof. The distillery will produce only 3000 cases which will be available in 20 US states at a suggested retail price of $11.99. First distilled in 1860 in Early Times Station, Kentucky, Early Times is a whisky known for its rich heritage and mild taste profile. Although the year 1860 congers up images of “early times” today, at the time, the brand’s original distillers believed the industry was turning too modern, too quickly, and wanted a brand that captured the “good old days.” Thus, the brand name Early Times was selected to remind consumers of the old-fashioned methods of making whisky – mashing grain in small tubs and boiling the beer and whisky in copper stills over open fires. Please put the 100 proof in full time production.